What is Fibre Optic Cabling? 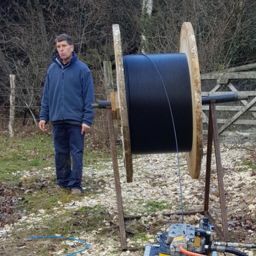 Fibre optic cable is the preferred medium for applications that require high bandwidth, long distances and immunity to electrical interference. It’s the most commonly installed backbone cable for this reason. Backbone cabling encompasses all the cabling between telecommunications rooms, equipment rooms, incoming services and between buildings. A fiber optic cable is a network cable that contains strands of glass fibers inside an insulated casing. They’re designed for long distance, very high performance data networking and telecommunications. Compared to wired cables, fiber optic cables provide higher bandwidth and can transmit data over longer distances. Fiber optic cables support much of the world’s internet, cable television and telephone systems. Fiber optic cables carry communication signals using pulses of light generated by small lasers or light-emitting diodes (LEDs). The cable consists of one or more strands of glass, each only slightly thicker than a human hair. The center of each strand is called the core, which provides the pathway for light to travel. The core is surrounded by a layer of glass called cladding that reflects light inward to avoid loss of signal and allow the light to pass through bends in the cable. The two primary types of fiber cables are called single mode and multi mode fiber. Single mode fiber uses very thin glass strands and a laser to generate light while multi mode fibers use LEDs. Single mode fiber networks often use Wave Division Multiplexing (WDM) techniques to increase the amount of data traffic that can be sent across the strand. WDM allows light at multiple different wavelengths to be combined (multiplexed) and later separated (de-multiplexed), effectively transmitting multiple communication streams via a single light pulse. Fiber cables offer several advantages over traditional long-distance copper cabling. Fibre optics have a higher capacity. The amount of network bandwidth a fiber cable can carry easily exceeds that of a copper cable with similar thickness. Fiber cables rated at 10 Gbps, 40 Gbps and even 100 Gbps are standard. Since light can travel much longer distances down a fiber cable without losing its strength, it lessens the need for signal boosters. Fiber is less susceptible to interference. A traditional network cable requires special shielding to protect it from electromagnetic interference. While this shielding helps, it is not sufficient to prevent interference when many cables are strung together in close proximity to each other. The physical properties of glass and fiber cables avoid most of these issues. 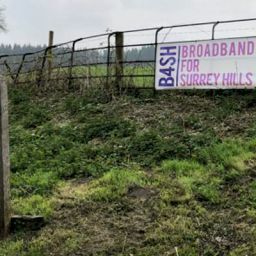 Surrey Hills resident and technology evangelist helping to bring 1Gig to as many local citizens as possible. Driver of all electric LEAF and keen cyclist in the hills. Have you seen our banner? 2019 © Copyright B4SH. All rights reserved. Website by Taybridge Digital.